In fact, they love to toy with everything related to language, including punctuation. The entertaining illustration to the left was created by Carrie Keplinger and inspired me to produce my own supplement to her study. The idea behind the graphic is to play on the meaning of different punctuation symbols and describe the type of personality they represent. I took the notion a step further, and based some of my psychological diagnoses on the appearance of the images themselves. I also fudged a bit and included a couple that are common symbols, albeit not punctuation. The Hieroglyphs are visible mirrors of the invisible, to use Jean-Luc Marion’s language, the recognition of which brings immediate awareness and experience of meaning rather than strict syllogistic definition. For Lewis, “thinking along” cannot be reduced to concepts. For Plotinus, Nature cannot be reduced to analysis. As Marion says, when faced with the visible mirror of the invisible one must look beyond the physical and experience the infinite gaze. Although the sunbeam is a physical reality I think it is a great example of “looking along” because it stirs us up to contemplate Beauty itself. Indeed God is Beauty for Lewis and for Plotinus (though not the Christian God for the latter). Punctuation is a fundamental tool of writers. And, like the broader subject of grammar, it is incumbent on us to do our best to use it properly. Naturally, when we are seeking publication of our work, we need to conform to whatever stylistic standards the venue follows. However, in our “personal” writing, I long ago learned there is no value in being enslaved to “official” literary conventions. After all, these seemingly rigid rules themselves are fluid, shifting with ever more frequent speed. I began with the declaration that lovers of words inherently enjoy wordplay. I certainly do. One evidence of that is found below, in my supplemental list to the chart at the top of this column. Immediately upon reading “punctuation social personalities,” my own mind, unbidden, began to consider additions. A moment later I had pen in hand, and the rest is history. Belated Warning: You may experience a similar irresistible response. 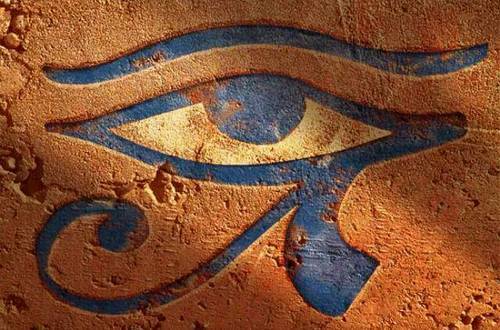 * A variation of the eye of Horus is actually found on American currency . . . at the peak of the pyramid that adorns the one dollar bill. (It’s officially called the “Eye of Providence,” but its association with the pyramid makes that title rather unconvincing.) It is actually reproduced on America’s money because it is found on the reverse of Great Seal of the United States. Yes, it’s portrayed on the hidden side of the extremely familiar eagle clutching an olive branch and arrows that we see all of the time. ** I’m not suggesting I am a trendsetter . . . merely that I anticipated the eventual elimination of these superfluous elements early on. Well, it’s due to that prediction combined with my own typographical prejudices, such as disliking the over-hyphenation of the English language. I love your chart! Very clever! I like your chart even better than the first. Thanks for sharing and for making me laugh. I especially love the insomniac and the dessert connoisseur. I don’t suppose your preferences reflect your personal proclivities..? Absolutely hilarious. 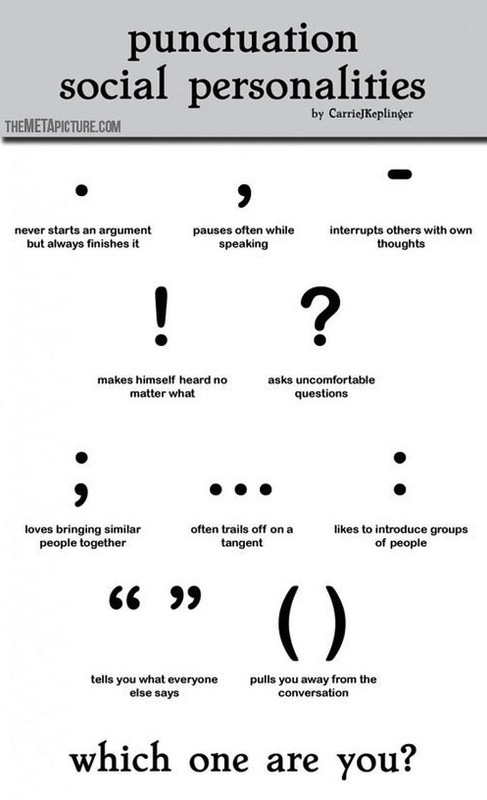 The punctuation chart is brilliant – created by someone who is a keen observer of people. $$$ = Successful materialist? That made me grin! In the same vein, perhaps something could be said for the * also :^) The * always qualifies everything he says to make sure he isn’t misunderstood. Hmmm… what would a “frustrated interrupter” be? Perhaps it’s the difference between an en dash and and em dash?